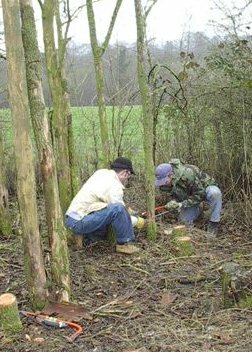 Bore Place is a popular venue in our programme and offers a variety of woodland tasks working with John Waller the Underwoodsman. The site is interesting and varied and the aims of Commonwork encompass sustainability, conservation, agriculture and education. 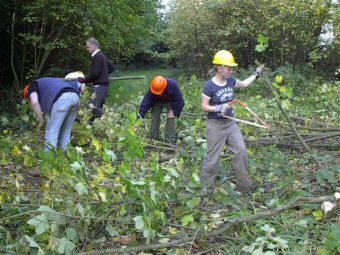 STCV volunteers have cleared ponds, coppiced Elm, restored hazel coppices and created new habitat along woodland rides. We also have a stand at the Commonwork open day to attract new volunteers. This is a picture of one of the two ponds we cleared of reed mace and other vegetation. It hadn't been touched for about four years and had become very overgrown and in danger of disappearing It has a dipping platform for educational purposes, which had become redundant which can now be used again. After many years of coppicing hazel stools will become gradually weaker and cease to regrow or grow fewer less vigourous new shoots. When this happens new plants need to be established. The traditional method is to layer a stem from an existing stool. This is cheaper than buying new plants and more productive than planting seed. First a stem is lowered onto the ground using a pleach cut, in the same way a stem is lowered for hedge laying. This is shown in the picture on the right. The lowered stem is held in place with pegs as show above. 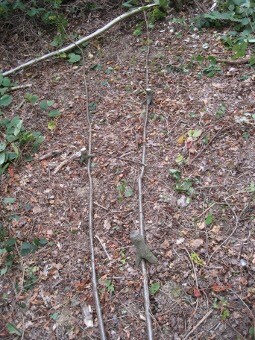 The pegs are cut from an ash tree felled earlier in the year. 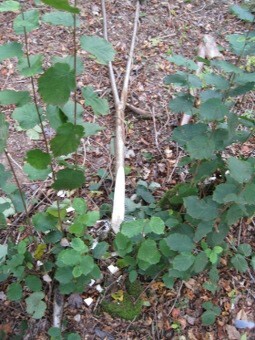 The result can be seen on a stem which layered about 18 months ago, several new plants are sprouting from side buds which are supported by roots growing from the bottom of the stem. Elm coppicing in an expanded field hedge known as a shaw at Bore Place. This is to prevent the recurrence of dutch elm beetle infestation which attacks maturing elm trees as they reach 15-20 years of age. The trees are therefore coppiced on a regular cycle to keep the shaw healthy. Volunteers had a chance to practice their tree felling skills once all the brambles and scrub had been removed. English Elm is unusual in that all the trees were propagated by suckers not by seed and had spread from very few, possibly a single, original plant. As all the Elms were genetically identical they were very susceptible to Dutch Elm disease because they no natural immunity because there was no diversity due to natural sexual selection.. Bore Place has areas of mixed wood land iwhich sit between arable areas of the farm. 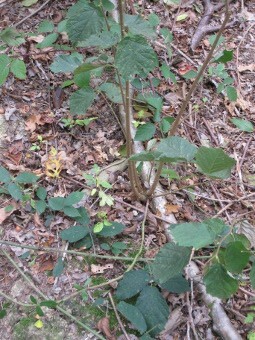 these are managed for productive timberm, the hazel coppice, recreation and conservation. 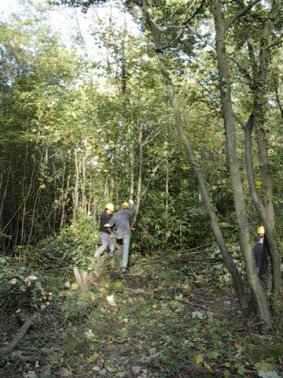 Here a large group of STCV volunteers are widening three areas of overgrown woodland ride on a public footpath. By creating scallops from the ride into the wood sunny open glades are created to to attract butterflies and encourage them to stay and lay eggs. Butterflies need the right plants to lay eggs on and open sunny areas for flying and courtship displays.